A reliable source for Computer Workbenches information and a resource for accessing leading Computer Workbenches and suppliers. Computer workbenches encompass a wide range of products including equipment, furnishings and accessories used to create practical and efficient work spaces for industrial and personal computer use. The term workbench can be misleading as these constructs often consist of a large flat table-like surface and attached units, such as shelving and drawers, as needed to improve organization and productivity by creating easy access to all tools and supplies required for the completion of a specific task. As computers are used in an ever growing number of fields, computer workbenches are increasingly seen in offices, schools, universities, warehouses, clean rooms and design departments. Visualization, CAD, surveillance, graphic design, data entry, document control and electronics repair and assembly industries have been built around the use and construction of computers and their corresponding workbenches. Workbenches not only organize, but also protect computers and electronic paraphernalia by creating safe and secure housing structures for these often delicate instruments. Computer Workbenches Computer workbenches encompass a wide range of products including equipment, furnishings and accessories used to create practical and efficient work spaces for industrial and personal computer use. Computer workbenches are designed to balance ergonomics, organization and productivity, creating the safest and most efficient workstation possible. 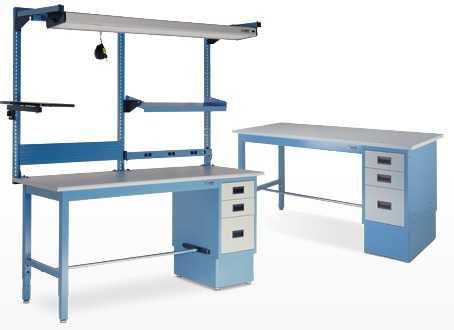 Standard and custom configurations are widely available with options such as compact or expansive and stationary or portable workbenches, further ensuring the best solution for computer work areas. Though some of these features are simply added on to a seemingly plain workstation, others are built in. Cord management, for example, is often added during manufacturing by drilling holes into the desk-like surface of a workbench through which cables may be drawn. The work surface can be made of a number of different materials including wood, plastic polymers and many metals. Materials used for the support structure, the legs and shelving components of a workbench, are also variable but should be made of sturdy materials. Some supports must be able to handle several CPUs at once and are therefore designed to withstand up to 1250lbs of weight per leg. Die-cutting, extrusion, injection molding, stamping and several other processes are used to produce different elements of computer workbenches which then require either consumer or distributor assembly. It is important to consider spatial restraints as well as necessary weight bearing capabilities when selecting the proper computer workbench as it must be able to conform to a work area and support valuable equipment.